IN THIS RHYMING STORY Suitable for children 2-8 years of age. The amazing SCOOTER FIVE set out on their multi coloured mini scooters to find the golden ring stolen from Mrs Mold. The great Lord John offered a reward to anyone who could find the golden ring. 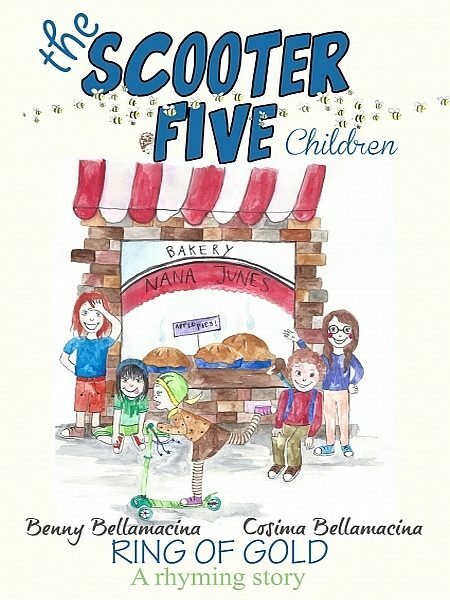 THE SCOOTER FIVE set out to the orchard and with the help of dog Guss find the ring that mysteriously ends up in Nana Junes apple pie. Throughout the land toddlers on their multi coloured mini scooters are zooming along the pavement. Somewhere in England in a small town five children race into action to solve many mysteries. Rhyming stories are used in schools across the land to help children learn the art of reading. "Rhyming books for kids are so important for the development of early literacy skills and should line the bookshelves in all classrooms and home libraries, wherever possible!". Otros ebooks de Benny Bellamacina.